The end of the year is nearly here and while children spend this time trying to convince their parents that they’ve been good all year, it’s not a bad time for grown-ups to take stock, too. 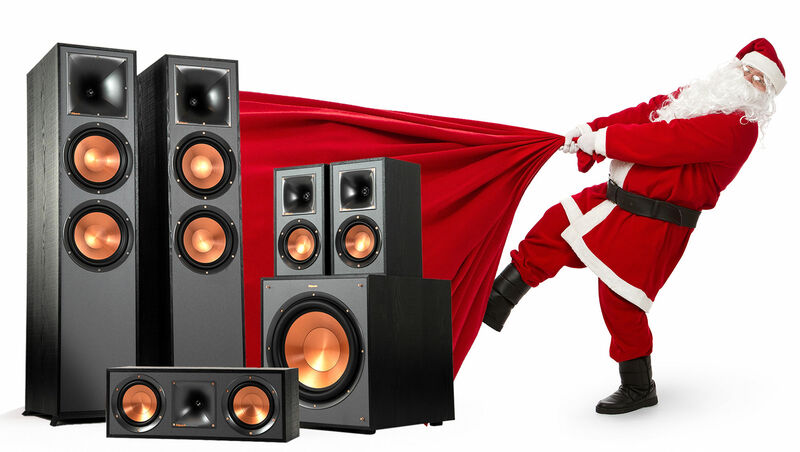 Whether you’ve been naughty or nice this year, Klipsch has great speakers for you or your loved ones. Clearly, you care about quality sound, which is why you’re on the nice list! Thankfully, Klipsch speakers go the extra mile to not only give you great performance but your wallet a break this holiday season. The RSB-11 soundbar will bring your favorite shows and movies to life with astounding clarity. Pretty nice right? Add a wireless subwoofer to the mix and it’s easy to install...and an even easier choice to make. With the discount available this holiday season on the RSB-3 soundbar, this is a nice option for just about anybody who has behaved but needs better sound. Want to start small? A simple stereo at an affordable price is the perfect way to build the audio system you’ve always wanted. Powered speakers like the R-41PM will be a nice choice for those looking for versatility. This pair of speakers can connect to almost any audio source without the need for additional equipment! Too easy. Klipsch earbuds provide unparalleled quality while also providing incredible comfort. And they allow you to play your music however you want without bothering anybody else. How nice of you! If you’re on the naughty list, don’t despair. We’ve all been there before. If you like to turn the music up loud, shake the walls, and possibly piss off the neighbors, we’ve got the products for you. Dolby Atmos is quite simply the best home theater available, and when you experience it with a quality Klipsch speaker like the R-625FA Floorstanding speaker, you’re going to make a few of your neighbors jealous. Why is The Three on the Naughty list, you ask? It puts all other speakers to shame because, with Google Assistant, it does things other speakers simply can’t do. Not to mention it sounds amazing. You’re going to be spoiled by this one! Massive, floor-standing speakers with big 8” drivers. The R-820F might be bigger than some of your furniture, but who cares? Your soundtrack is more important! If you’re feeling slightly less naughty, the R-620F takes up a little less space, but it also gives you some serious sound. Is there anything naughtier than a subwoofer? Wait, maybe don’t answer that right away. Anyway, deep, booming bass notes enhance your favorite tracks or the massive action scenes of your favorite movie. Small speakers like those found in the Reference Theater Pack might look cute and nice - but, this is Klipsch! Get everything you need for your surround sound system in one sleek package. It’s so easy it’s almost unfair.